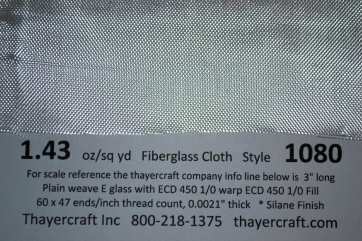 Style 1080 fiberglass cloth is a 1.43 oz/sq yd plain weave E-glass fabric referred to as the "medium weight" glass cloth in the model industry. As with all fabrics the finish makes a big difference in the way the fabric handles. The cloth you buy in this listing is finished in a medium soft silane for epoxy resins. The 1080 we have at the moment suitable for model builders is available in 38 and 44" widths. The prices in the PayPal link include free shipping to any of the 48 continental United States with most orders with purchases completed by 1 pm Eastern time shipped the same day.